Bacon bits on a white counter. Cure hog belly with any combination of sugar, salt and smoke and you have bacon. Butchers sell bacon in same-size and same-thickness slices or in whole slabs. They sell the leftover ends from sliced slab bacon for seasoning or render them into lard and bacon bits. Because of extensive handling of the pork belly every time it went onto the slicer, bacon ends and pieces require careful handling and cooking to prevent food-borne illness. Heat a saute pan on medium-high heat for two minutes. Sort the ends and pieces into separate piles by thickness. Place the pile with the thickest pieces in the pan first -- in a single layer -- with 1/8-inch space between each one. Cook the pieces for at least two minutes. Lower the heat to medium to keep the grease from smoking and prevent burning the edges of the bacon ends and pieces. Turn them over one at a time, beginning at the 1 o'clock position on the outer edge of the pan, working across the pan from right to left and top to bottom. Remove the lid from the metal container. Pour the bacon grease into it whenever the grease in the pan is more than 1/4-inch deep. Continue to fry the thickest bacon ends until as much grease renders out as you prefer. Remove the bacon pieces from the pan when they lose more than half their thickness in grease, depending how crisp you like your bacon. Lay the bacon ends on paper towels to absorb excess grease. Cover them with a second paper towel and press to remove additional grease. Slide the bacon ends onto a serving platter covered with additional paper towels. Fry the next-thickest pile of bacon ends using the same method, and continue until you fry each pile to the desired crispness. Pour off the grease every time it is deeper than 1/4-inch. Buy bacon last, store it in the coldest part of the refrigerator and use it within four days once you open the package. 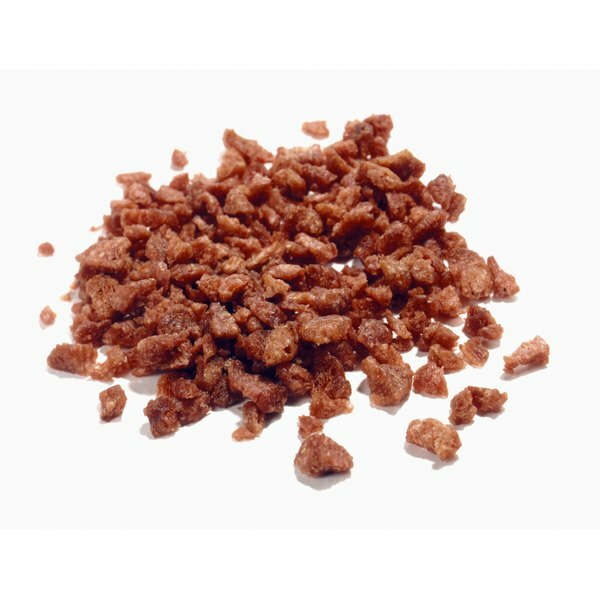 Frying bacon at high temperatures produces a chemical reaction between the amino acids in the meaty portion of the bacon and the nitrites used in the curing process. Avoid nitrosamine production by frying bacon at 210 degrees Fahrenheit for 15 minutes, 275 degrees for 10 minutes or 275 degrees for 30 minutes. Microwaved bacon produces fewer nitrosamines than fried bacon. Cook ends and pieces on a microwave-safe bacon-cooking tray after sorting into same-thickness piles for 10 seconds at a time. Pour off the grease if it fills the recessed portions of the tray before the bacon reaches the desired crispness. Allow the bacon to rest for one minute before serving.